Update on Nigerian Police Force Enlistment 2019/2020 see more details here; new recruitment portal has been opened for registration. Qualified applicants can now apply online through the approved recruitment site. 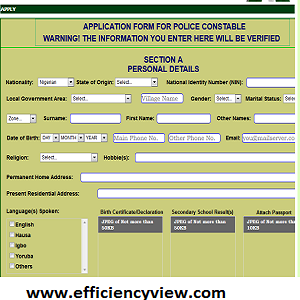 Update on Nigerian Police Force Enlistment 2019/2020 – Police Service Commission has stated that any applicants who enter wrong information will be automatically disqualified, note that all information you entered will be verified. This is to inform the general public about the latest Update on Nigerian Police Force Enlistment 2019/2020, the new portal have been change to www.nigeriapolicecareers.net but those who are still making use of the initial portal can apply through the initial portal to portal.